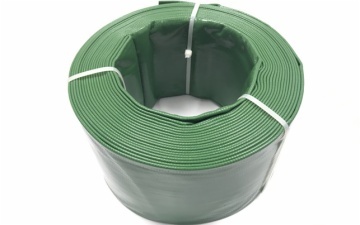 Medium Duty PVC Layflat Hose is also called water hose, water discharge hose, drain hose, washing hose etc. Which is an ideal hose designed for medium pressure liquid delivery. Mainly used for multipurpose delivery, water and light chemical discharge, medium pressure sprinkling, industry waste water drain and water washing in factories and construction, submersible pumping, portable hydrant fire fighting and so on. Flexible and tough PVC are extruded together with 3-ply high tensile polyester yarns, one longitudinal ply and two spiral plies. PVC tube and cover are extruded concurrently to obtain good bonding. Premium quality, good flexibility without kinking, smooth tube with low friction loss, lay straight with minimal elongation under medium pressure, non-water absorbing, different colors available, abrasion resistant, aging resistant, lay flat for easy storage, easily fix with couplings and clamps, assemblies or cut length available.